Mrs. Selwyn : Surfboard Riding on Norfolk Island, 1868. Society for Promoting Christian Knowledge, London, 1873, pages 63 to 64. Inspired by the missionary work of Gerorge Augustus Selwyn, the Bishop of New Zealand, John Coleridge Patteson joined him in there in 1856, where he worked with Maori. In 1861-1862, his Pacific travels included several visits to Norfolk Island and the establishment of a mission. In August 1868, the Norfolk Island Mission was visited by Mrs. Selwyn, the wife of the New Zealand Bishop. Norfolk Island was previously a penal settlement established to disipline recalcitrant convicts from Port Jackson (Sydney), but was now the home to some of the Bounty descendants, who were relocated there in 1856 from Pitcairn Island. These descendants where the progeny of European sailors and Tahitian women, who on Pitcairn retained surfboard riding as part of their Polynesian heritage and brought their skills to Norfolk Island. Although the book does not have a accredited author, it was probably by Charlotte Mary Yonge, an enthusiastic moral and financial supporter of Patteson's evangelical work, and largely based on his correspondence. 1862 J.C. Patteson : Santa Cruz Islands. "Yonge" gives a brief overview of the Norfolk residents, in particular noting their enthusiasm for surfboard riding that was originally transfered from Tahiti (predominately by females) to Pitcairn Island. This section essentially quotes the earlier report from Pitcairn by Dr. Ramsay in 1821. Importantly, this section does not appear in original 1873 edition, accredited to Yonge. Murray, Rev. Thomas Boyles: Pitcairn: The Island, the People, and the Pastor; with a Short Account of the original settlement and present condition of Norfolk Island. Committee of General Literature and Education Society for Promoting Christian Knowledge. Society for Promoting Christian Knowledge, Great Britain, 1857, Eighth edition, pages 209-210. It is probable that the author included Ramsay's report based on Mrs. Selwyn's account, which appears as a footnote on page 64. Halcombe, Rev. J.J. (editor): Mission Life- or The Emmigrant and the Heathen. William MacIntosh, 24 Paternoster Row, London, 1868 (Volume 5), page 562. The Melanasian Mission, page 519. CHAPTER XIII, Mrs. Selwyn's Visit to Norfolk Island. "Ondines (Latin: Onda — a wave) are elementals, enumerated as the water elementals in works of alchemy by Paracelsus. They also appear in European folklore as fairy-like creatures; the name may be used interchangeably with those of other water spirits." 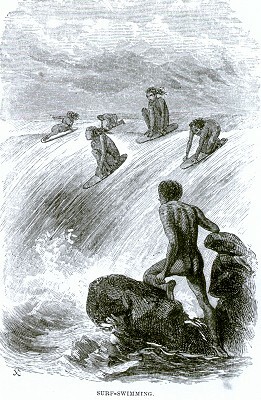 The surfboard riding illustration facing page 64 is extremely rare for this period and is highly similar to the work of Wallace McKay, who also illustrated Charles Warren Stoddard's Summer Cruising in the South Seas, 1874. Surf-bathing was an established pastime on Norfolk Island for officers of the penal settlement, before the arrival of the Bounty descendants from Pitcairn in 1856. "The North Steyne Club has forwarded for confirmation to the Surf Bather's Association a programme for the club's annual carnival. Norfolk Island will be given." - Sydney Morning Herald, 1 December 1912, page 12. Mr. Bouffett was probably a descendant of John Buffett who arrived on Pitcairn Island in December, 1823 on the British whaler, Cyrus. Chapter V, Visit to Norfolk Island circa 1861-1862. It may not be amiss here to say a few words about the condition of the Norfolk Islanders at this time. The favourite occupation of the men was whaling, and galloping after their cattle, varied with work in their gardens and plantations. The women were chiefly occupied in attending to their dairies, and sewing for their numerous families. All were fond of reading, and anxious to gather information of the world and its history. Both sexes were extremely industrious, usually rising at dawn. Both morning and evening each household assembled for family prayer. Both boys and girls learned to swim almost as soon as they could walk; consequently they could swim through the roughest surf, and play about in the broken water amongst rocks, without the slightest sense of danger. ... slide, as they term it; that is, to take a piece of wood about three feet long, shaped like a canoe, with a small keel, called a surf-board. Holding this before them, they dive under the first heavy sea, and come up on the other side. Mrs. Selwyn's observations are dated August 1868 in Halcombe (ed): Mission Life (1868), page562, see above. "Coming home one beautiful evening, I met some girls going down to the jetty to see fish which had been caught this calm day. It was a pretty sight indeed, in the brief twilight, the gay-looking fish lying on the stones in the water, where the great waves were not rolling furiously in, coloured by the glowing sky. Some of my companions longed to jump in. 'That's the fun,' whispered a young girl at my side. At Pitcairn, it seems, the' fun' was to swim out to sea, pushing a surf-board before you, and then to come quickly back with it on the top of a huge roller.
" 'You can swim ?' asked a delicate-looking young mother of me, as we stood together; and when I owned my ignorance, the compassionate, half-contemptuous tone of her reply was very funny. Men, women, and children here take to the water like so many ducks. The girls think it a great pity that I, who am 'such a seafaring lady,' do not know how, and offer to teach me. 'You would soon learn from me,' said a noble-looking creature, reported, I believe justly, to be the best swimmer of the party. These fine days promote a great desire for bathing. It would be pleasant before the sun was so hot as to blister them, which it seems it did dreadfully at Pitcairn in the Christmas holidays, and no wonder, as they were chiefly spent in the water. Fortunately they were short, as for six hours at a time would these mermaids remain in, with their surf-boards, swimming races. The great piece of fun was for one to keep possession of a rock in the middle of Bounty Bay, whence the rest would try to pull her down, and whence she would fling them off into the water. A Christmas-tree would be rather poor after this sport." 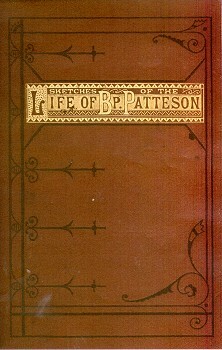 similar to the work of Wallace McKay. Surfing Images 1870 - 1890. Geoff Cater (2011) : Mrs. Selwyn : Surf-riding at Norfolk Island, 1868.